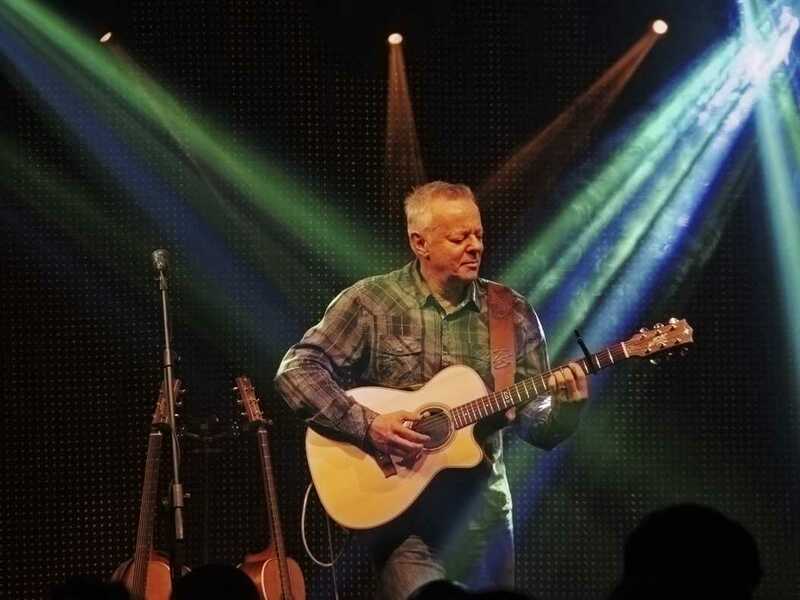 Tommy Emmanuel picked up his first guitar at four years old — and has spent the rest of his life with a guitar in hand. Emmanuel, a 61-year-old Australian guitarist, has played on stages around the world, from Poland to Italy to Russia. As part of his U.S. tour, Emmanuel played at the Byham Theater in downtown Pittsburgh Feb. 26. He’s released more than two dozen albums since 1979, and received a Grammy nomination for “Best Country Instrumental Performance” in 2007. Emmanuel exemplifies the fingerpicking technique — using his fingers instead of a plastic pick — but his technique transcends genre. He plays bluegrass, blues, country and even covers of famous bands such as The Beatles. The Pitt News talked with Emmanuel about his childhood, his time on the road and the central role music plays in his life. The Pitt News: Could you tell me a little bit about how you got into guitar playing and music in the first place? Tommy Emmanuel: I started at four years old, and my mother was already playing a little bit — and I’m one of six kids and we all were crazy about music … My dream when I was a kid was to do what I’m doing now — to be a concert player and travel around the world. TPN: When you were four, did you have a full-size guitar? TE: I had a three-quarter size guitar. It was hard to play. But if I showed you a photograph of me at three or four years old, the thing that would strike you immediately is that I had huge hands. I had, like, monkey hands for a little boy. It’s hard to explain that, but my hands were already much bigger than the rest of my body. TPN: Were you taking lessons at that point? TE: No, I’ve never had lessons. I don’t read music. I’ve never had training. I play everything by ear. I’m the Indiana Jones of the guitar world. I’m constantly learning from everybody. I watch people like a hawk, and try to be a sponge around great musicians. When I get that opportunity, I’m always trying to learn something new. Life is our great teacher, and presents us with situations where we can definitely expand our knowledge, and you gotta keep your antennas up. TPN: How does that feel, to accomplish the goal that you’ve had since you were a little kid? TE: Well, it’s a wonderful life. It’s taught me so much. You need to figure out how to do things the best way, and how not to go crazy on the road, and all that sort of stuff. You need to learn a lot of lessons about that kind of stuff, and learn how to pace yourself and learn how to be in a position to give your best every night. And that’s really, that’s my goal. TPN: Do you have children? TE: I have three daughters. I have a 28-year-old, an 18-year-old and a 2-year-old. TPN: How do you balance family life with traveling all the time? TE: It’s not easy. And you pay a high price for it. I haven’t been around a lot sometimes when my elder daughters — it would’ve been better if I could’ve been with them. But that’s, you know, that’s the price you pay for your choices. And I have to do this — this is what I do, this is how I make a living, but it’s also my mission in life, it’s my calling. I’m called to play and I’ve gotta get out there and play. At the same time, I’m in touch with my family every day. I skype with my wife and our baby daughter every day. My two grown-up girls are in England, so I plan trips there. There’ve been many times when I go to England and spend two weeks there, and I don’t work, I’m available every day and every night for them. I do my best to make up for the time that I’m away, but it’s just the way it is. TPN: Was there any other career path that you considered at any point? TE: No. I’ve been a bass player and a drummer. In fact, there probably isn’t a musical situation that I haven’t played in. I’ve done bluegrass festivals, blues festivals, reggae festivals, country music festivals, rock ‘n roll, jazz — I’ve had a go at everything. I’ve even done comedy, I’ve done game shows, I’ve done television shows… Eventually you have to find what it is you think you do the best, and you try to find a way of standing out, because the world is so full of incredible talent and entertainers and people who do things on a great level. And you have to find your own way of standing out from the pack. And that usually involves having your own style, your own sound, and writing your own music and playing in your own way. That’s the way you can stand out. TPN: What is it like to be on stage? That’s how it feels to me. I was born to be on the stage, and I’ve always known it. I’m just doing what comes natural, and I’m trying to have the best time I possibly can with the audience every night. I’m flying my kite as high as I can. TPN: Have there been any particular performances that stick in your memory — interactions with the audience, things like that? TE: There’s a lot of those experiences that I could tell you about. Sometimes, people do stuff like, “Can you play a particular song, because I want to propose to this woman during that song.” So I’ll organize to play that song, and then at the end of the song, I’ll say to the audience, “Here’s Jeff and here’s Elaine — or whatever — Jeff, you got something to say to Elaine?” And he’ll turn and say, “Will you marry me?” And it’ll happen right there in the audience. TPN: How do you foster a good rapport with the audience, and keep that going? TE: You have to have a desire to have a relationship with your audience, and to present to the audience who you are. You have to be willing to be in a very vulnerable position. That’s the way love really works, is if it’s totally vulnerable. When I go out on stage, I’m not doing anything except saying, “Hi, I’m here to do my best for you.” And when people respond to me, I respond back. We both bring the best out in each other, that’s the whole idea. If I can make people feel relief from the stress of life — whether it’s stress or sadness or whatever — if they’re not thinking about their troubles for two hours, then I’ll take that anytime. TPN: When you are on the road, how much time are you spending practicing per day? TE: I practice what I think I need to practice. This morning … my bus driver — who’s a good singer — and I, we sang through some country songs. When you sing, you tap into that creative part of you and you stir it up. That’s why singing is such a spiritual experience, because it taps into the soul somehow. So, [my bus driver and I] were singing songs this morning and getting [goosebumps], and that’s a good thing, that means I’m alive and I’m stirred up, you know? TPN: What’s your favorite thing about playing? TE: How it affects people. Seeing the effect that music has on people is the most incredible motivator that I know. If I play well and to my standard — I’m very fussy, I have a high standard to try to reach — if I have a great night and my ideas seem to just flow naturally, that’s the greatest high there is. The only problem with it, is that you’ve gotta do it again tomorrow.